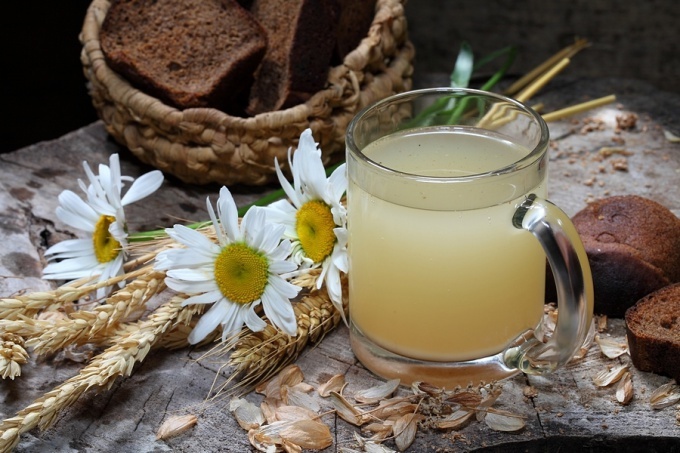 Kvass is a cold and refreshing drink that can quench your thirst and use as the basis for making hash. Home brew is prepared quite easily. There are many original recipes of kvass at home, which not only make this drink delicious, but also useful. Loaf of rye bread cut into slices. Then spread bread slices on a dry baking sheet and put in oven at maximum temperature. Wait, when the bread slices will become dark in color. You must make sure that the bread does not burn. Put the breadcrumbs into a suitable container and pour 5 liters of boiling water. Cover with a lid and leave to infuse for 5 hours. Using cheesecloth strain the wort, add a table spoon of yeast, half a Cup of sugar and a tablespoon of raisins. Stir, cover and leave overnight. The finished product bottle, are clogging and put to cool in the fridge. A mixture of dried fruits fill with water and boil 10-15 minutes. Dried rye bread to fill with boiling water and leave in a sealed container for 3 hours. A decoction of the dried fruit and the wort is filtered and connected together. Add the sugar, yeast and put in a warm place for fermentation. Vibrative pour kvass into bottles and put in each 3 raisins. Put in a cold place. Instead of sugar you can use boiled water with honey. After 3 days the kvass is ready. To cook is exactly the same as classic, but additionally add a little honey and flavored with fresh or dried grass of mint or oregano, lowering a gauze bag in the brew for 10 hours. Mint gives a refreshing taste, and oregano improves digestion. The roots of Acorus calamus have a beneficial effect on the digestive organs, improve the condition of gums, reduces blood pressure. Prepared in the usual way kvass add the infusion of calamus. 3-liter jar of kvass, add 1 Cup of infusion of sweet flag root or put in a gauze bag dried roots of calamus (80 grams) for 5 hours. Carrots wash and peel. Grate on a coarse grater and place in a 3-liter glass jar, add the dried brown crust of bread, pour warm boiled water and insist 10 hours, covering the jar with cheesecloth. After the infusion liquid (wort) is filtered and added diluted with warm water yeast with a little flour and put to ferment for the night. You can then add pinch of citric acid. Work not only refreshing, but also rich in vitamins and minerals drink. To 3 liters of brew will need 150 grams of carrots, a Cup of sugar, 20 g yeast, 500 grams of rye bread, citric acid, a tablespoon of flour. For making kvass "Catherine" cook 700 grams of lemon, a handful of raisins, 500 grams of sugar, 50 grams of yeast and 10 liters of water. In a pot of water, adding sugar and waiting for the water to boil. Then you need the sugar water to cool. Grate lemon zest from lemons to squeeze the juice, mash the yeast and add all to the pot. Mix everything, throw a handful of raisins and place in a cool place for 3 days.